Even though I'm still feeling sick today, I'm definitely on the mend. That cold was brutal, but it appears to have been short-lived, so overall I suppose I should be grateful. 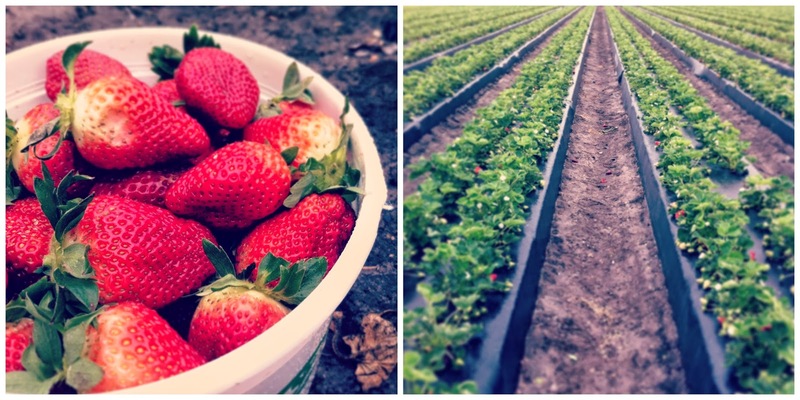 I felt so much better today that we drove to our favorite pick-your-own farm in Wilmington. It's a bit early in the season, but there were plenty of strawberries to be had. Nathan and I filled three buckets between the two of us in less than a half an hour. My goal this year is to go early and often - I want to can enough jam to last us until next summer. Jam making will have to wait until later this weekend, though, as the outing wore me out. I'm on the mend, but not quite 100% yet. I've taken the idea of risk, my 2014 mantra, to heart, and am giving myself a year to try and make it as a freelance writer. I've already got some things going, I've been pursuing every opportunity that comes along, and things seem to be looking up for me as far as self-employment goes. Now, I can really only afford this risk because Nathan has a steady, full time job, and can fill in the gaps while I find my way. But considering I supported him for many years and through many degrees, he owes me and is happy to support us while I try to see if writing for a living is actually feasible. Right now I'm feeling positive and looking forward to all the things on my horizon. I know that's vague, and I'm sorry. I'll blog more about things if and when they unfold. I had my final workshop this past Tuesday, and it was a bittersweet event. On the one hand, I love the feedback I've gotten these last three years on my short stories, essays, and novel excerpts, and fully believe that workshop is the number one thing that has made me a better writer. On the other hand, I've found the three or four readers who give me the best advice, and I'm looking forward to a future of swapping work with the people I trust most, rather than with a classroom full of people who just happened to be taking the same class. A few weeks ago I gave my students the first chapter of Wild. We discussed it in class, and they seemed to enjoy it. A few weeks later, one of my students told me she liked the chapter so much, she bought the book and couldn't put it down. As if that wasn't enough, she also wanted to know if I could recommend any other books she might like for her summer reading list. It's safe to say I was in teacher heaven. I'm going to put together a "Further Reading" list and give it to the class on the last day. My only regret is that I haven't been doing this from the beginning! 5. Goodbye, Winter. Hello, Sunshine. I know some of you got snow recently, and for that I am very, very, very sorry. Here in Wilmington, however, spring is in full force. We've got azaleas. We've got sunshine. We've already had one 89F day. I've been kayaking and spent a day on the beach. I'm already working on my tan. I say this not to brag, but - okay, fine, I'm bragging. North Carolina isn't perfect by any stretch of the imagination, but during this time of the year it comes pretty damn close. I hope you've had a good few weeks as well! Tell me something that's been making you smile, and we can celebrate together.